Keep moving on, and keep on moving. No matter what happened to us in the past, every day brings a new starting line. And with it, a new opportunity for us to run towards new dreams. A new possibility for us to start over. And a new chance for us to make a new promise to ourself. 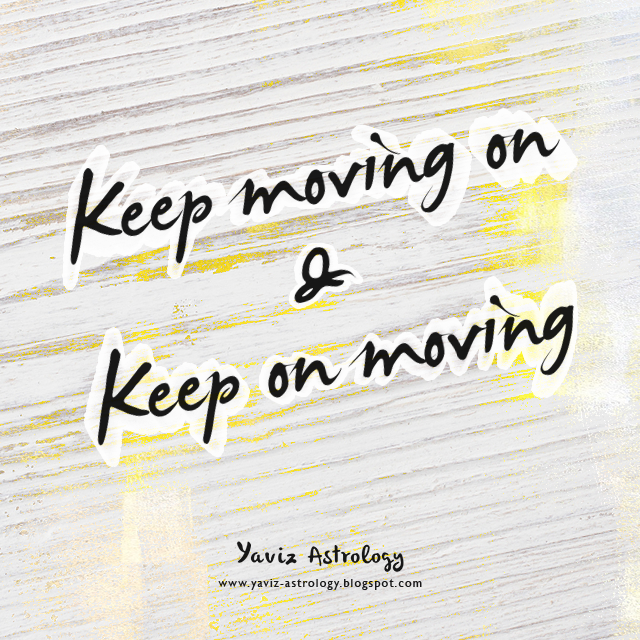 The Moon in Gemini is conjoining with Mars and Mercury - which is turning retrograde, reminding us that we have a choice to help things move along or to just let the magic happen on its own. Whichever it is, choices can change at this time, pointing us in a new direction. Certain events or people from the past could remain a mystery, but they will bring to us new revelations and insights. With the Moon's opposition to Saturn Rx and square to Neptune, take a longer look, we can let intuition guide us to do something different or to leave it for another time. Remember that there is a positive side to everything. Trust our instincts on this, especially when faced with difficult decisions. Special consideration should be given to our feelings as patience may be in short supply at times. Happy music can make us feel uplifted, contented and help stimulate production of more endorphins - aka the feel-good hormones. 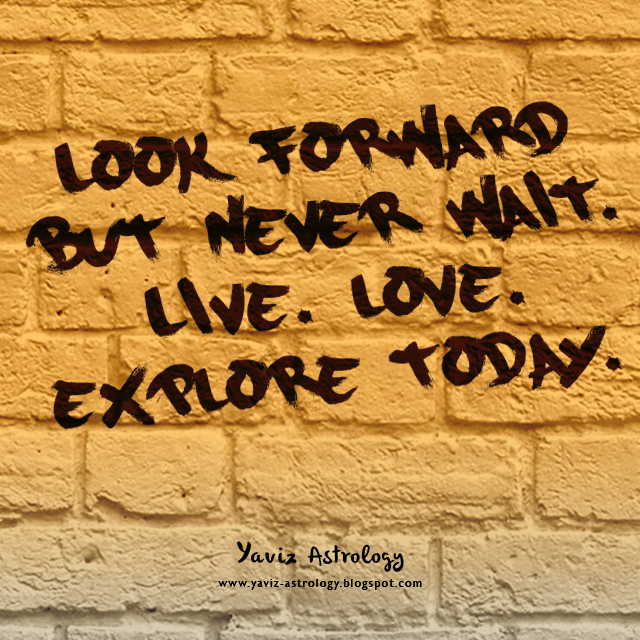 The Moon is also forming a sextile to Jupiter and Uranus, and there's a more optimistic outlook towards life. This comes from a new-found awareness towards our own sense of personal power, and our openness to let go of outdated beliefs and self-imposed limitations. Feel free to speak up, as our honesty will help make sense of obstacles we encounter and to knock them out of our way. Don't be afraid to put some of our ideas to the test, the unexpected may very well work out the best. Carry out ideas with a firm goal in mind. We are ready to take action where needed to get things moving in the direction of our dreams and personal evolution. Moving is the word. 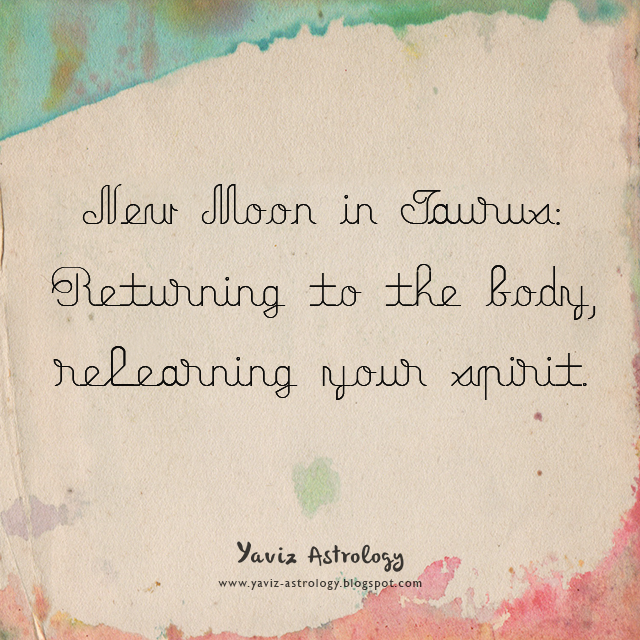 New Moon in Taurus: Returning to the body, relearning your spirit. What makes our soul happy? What makes our heart sing? What hurts our ego? What pains our mind? Where can we find our solace in the midst of grief? And how can we reclaim our inner power? By relearning what makes our spirit rise, we can begin to grow in a new direction. By recapturing our sense of purpose, we can become more in alignment with our soul. Begin listening more closely to what our spirit is trying tell us, and we are on our way to becoming a more powerful friend to our body, soul and spirit. Happy New Moon! The Sun and the Moon are forming a conjunction in Taurus, marking a New Moon in the sign of the Bull. It's a time of new beginnings. A time when we can find new ways to connect with our body. A time when we can hear our spirit speaks, as we are eager to learn more and start anew. The Moon is forming a sextile to Venus and Neptune and a trine to Pluto Rx, and we can paint our world with magic words and feelings. Go with the flow and enjoy the simpler things in life. Listen to our favourite music, eat our favourite foods, light our favourite candles, or take a warm bath before bed. Anything that delights the senses can inspire our imagination and nourish the soul. Bring more comfort into our life by sorting out chores that have lagged behind. Get rid of cobwebs to sweep out old energy and make space for new energy. With the Moon's square to Jupiter, there may be a tendency to overindulge or overdo our attempts to find comfort. Feeling secure in our life doesn't just mean that we are content with the external elements in our life. It also means that we have some degree of security in our sense of self. Let go of the need for external validation. Find a more secure base within where we can rebuild our foundation, and start a new relationship with the inner self. It's time we embody our most empowered and authentic self, and become a magnet for truth, love and magic. Renewal requires opening yourself up to new ways of thinking and feeling. The more we explore, the more mistakes we could make, and the more possibilities for learning we will find. The less we explore, the less mistakes we could make, and the less possibilities for learning we will find. By opening ourself up to exploration, we can begin to change our journey, and open ourself up to the ever-expanding possibilities for new growth, new hope, and new discovery. The Moon is once again joining with Uranus - now at 18° of Aries, and we have a more open mind to let out more of our creative impulses. The next few days may bring in a mixed bag of surprises and emotions, so try to keep our sense of humor in tact and focus more on the positive side of things. With the Moon's trine to Saturn Rx and Jupiter, and the sextile to Mars and Mercury, we quit chasing rainbows as we discover that there's a lot we can achieve in the short term by being patient. We are more independent and determined and will enjoy working on projects that require our passion and drive. We have a lot to think about, and now would be a good time to make our life seem more organized by practicing our new sense of self-discipline. The Moon is also forming a square to Venus and Pluto Rx, and we will see our way through any unusual situation that develops as we realize that we actually have more bravery and backbone than we thought before. Keep our goals in mind as it's easy to spin out of control when we forget our sense of direction. Let go of tendencies to force things to happen, and we'll soon see that this cycle we are moving into can propel us closer to our dreams and highest potential.